You can also read this guide in Français. Wondershare SafeEraser is a data erasing tool for both Windows and the Mac that most of you might be familiar with. For those who are not, it is a tool that helps you erase various types of data files completely. What this means is that quite generally, the files that you delete do not get removed permanently and can therefore be accessed with the appropriate software and techniques. However, Wondershare SafeEraser erases all of such files from the roots so that they are unrecoverable. This is very important if you have some very sensitive data that you do not want to divulge. However, SafeEraser can be quite inefficient at times. Firstly, it does not have many essential features that most other products do with regards to data erasing capabilities such as the option to delete certain file types. Secondly, given its functionality, SafeEraser can seem pretty expensive if compared with similar data erasing software. Thirdly, it does not give you the opportunity to view the files that you want to delete. This means you may not be able to individually select the files that you want to delete. Furthermore, the interface is not very user-friendly and has a complicated navigational design. Also, SafeEraser has already been out there in the market for a while and this means that hackers would have already found a way to get around it making it much less secure. Due to the dangers and inefficiency associated with using SafeEraser, a better alternative that might be very handy is iMyFone Umate Pro or iMyFone Umate Pro for Mac. 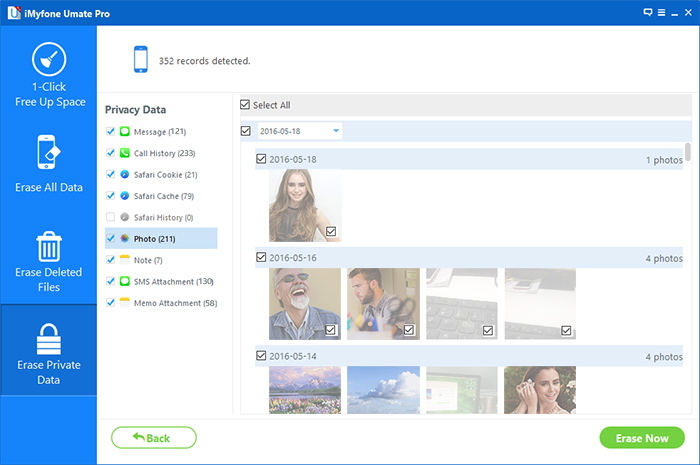 Similar to SafeErase but more effective and secure, iMyFone Umate pro is available for Mac, PC and all iDevices and erases data leaving no trace at all. The data cannot be recovered by any means. One of the benefits of this tool is that it allows you to preview the data files that you may want to delete. 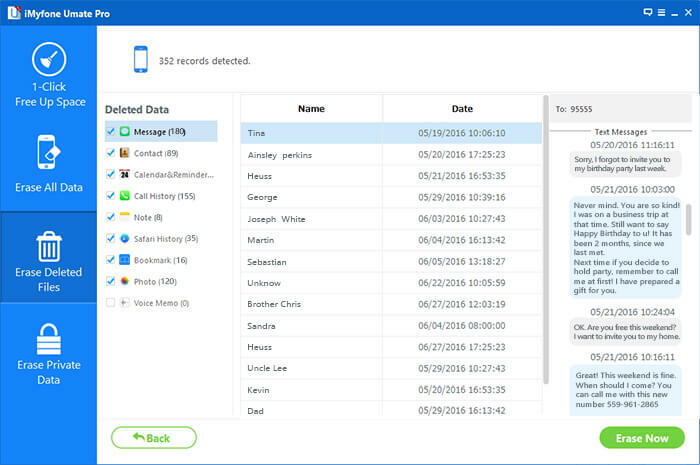 It scans your computer for all the files and displays the list of the personal and recently deleted files on your device. You can then select the files that you want to delete which means you can be assured that no important files are deleted. Erase All Data This is very useful if you want to sell your phone but do not want your files to be viewed by someone else. As the name suggests, you can delete all the data permanently using this mode. Although this can even be achieved through resetting your device to Factory Setting, but the data deleted by Factory Setting will still be present in the system. Erase Deleted Data This mode allows you to remove the files that you have already deleted. The files that you delete do not get erased properly and so iMyFone eradicates them irreparably. Business people may often want this to remove the confidential emails or reports that they fear might get leaked. 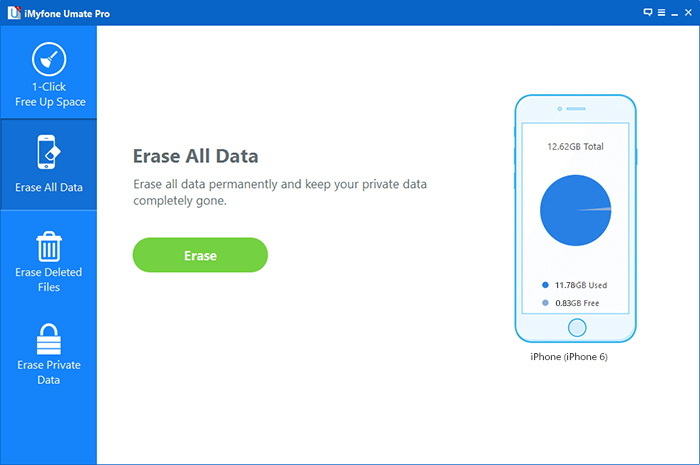 Erase Private Data This is a very useful feature of the iMyFone Umate Pro. It allows you to delete only that information which is private in nature by allowing you to select files individually. Such information is usually related to business, government agencies etc. which need to keep a lot of elements as a secret. This mode will enable them to do so efficiently. 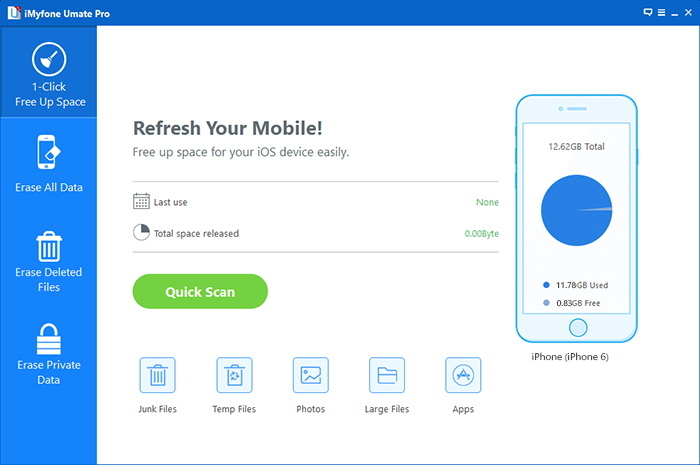 1-Click Free Up Space iMyFone Umate Pro can assist you in increasing the amount of space by deleting redundant files. This function is called the 1-click cleanup. This is because all you have to do is click once and you will have a lot of space in your device available. iMyFone Umate Pro is therefore a very innovative tool that can erase almost every type of file from iOS devices. This, only at a cost of $29.95. How to use iMyFone Umate Pro? 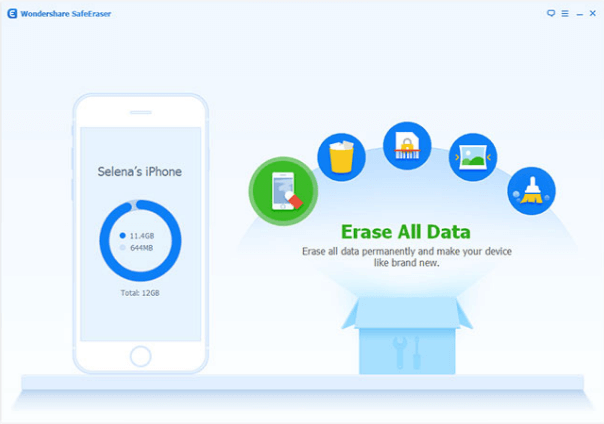 Now that you know what iMyFone Umate Pro is, the following steps will show you how you can use it to erase files from you iPhone. Step 1. Launch iMyFone on your computer and connect your iPhone to the computer. Step 2. Once the phone is connected, you can select any erasing option you want. Let’s say you click ‘Erase All Data’. Step 3. Click the erase button and then type ‘Delete’ in the type box. You can choose the Security level according to your needs as well. Step 4. Click ‘Erase Now’ and all your files will be permanently deleted.